Exhibit #12,984 of why our reputation on the world's stage has plummeted during the seven years of the Bush administration: John Bolton. You have to love the logic of the neo-con crowd. Appoint a blustery, combative idealogue with no concept of empathy or compromise, much less diplomacy, to represent the US around the world. Like Juan Williams pointed out, Bolton's whole modus operandi is to get angry that every country doesn't defer to American interests. I'd say that level of arrogant bullying and delusions of grandeur would be indicative of overcompensation for more inadequate parts of his person, but only Pammy Atlas would know for sure (sorry, I threw up in my mouth a little at the thought). And here is Boltin' Bolton trashing the UN, the IAEA and Chief Inspector Mohammed alBaradei for daring to deny the official Bush Administration's stance on Iran's nuclear program. BLITZER: Not one to mince any words, my next guest says the Bush administration foreign policy is, quote, "something like in free fall right now." That's just one of the rather blunt opinions the former U.S. ambassador to the United Nations, John Bolton, has in his new book. It's entitled, "Surrender is not an Option: Defending America at the United Nations and Abroad." BOLTON: Glad to be here. BLITZER: Let's talk a little bit about Pakistan first and foremost. It's obviously an awful situation right now. There's a crisis there. It could get a lot, lot worse, as you well know. What should the Bush administration be doing right now? BOLTON: I think we have to focus on our principle strategic equity, and that's safeguarding Pakistan's nuclear arsenal from falling into the wrong hands. I think that -- I'm not here to defend Musharraf or his actions, but I think that in this very volatile situation, the last thing we need is instability in the government. And I think that's what we ought to focus on. I think the administration, I'm afraid to say, has given mixed signals in the past few days. I think today it's come out very clearly about what needs to be done to keep Musharraf, keep his level of support up. But make no mistake, this is a very dangerous situation. BLITZER: So what I hear you saying is the U.S. has to support Musharraf because he controls the military, and the military has to keep the nuclear arsenal secure? 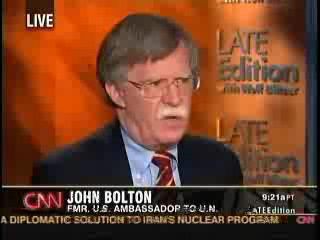 BOLTON: We really have to look at the alternatives, and I frankly don't see the alternatives. They Pakistanis don't call the military the seal skeleton of their country by accident. The record of civilian governments has not been great since partition and independence, and especially now when radical Islamicists would love nothing better than to get their hands on some of Pakistan's nuclear weapons. This is not the time for democratic theory. BLITZER: Richard Armitage, who we interviewed in the last hour, thinks that nuclear arsenal's very secure. They've got tight controls. He used to deal with arms control, disarmament at the State Department before he became the U.S. ambassador to the United Nations. Ambassador Holbrooke wasn't so convinced it's all that secure, in part because the U.S. has never been allowed to speak to A.Q. Khan, the nuclear scientist who helped develop Pakistan's nuclear bomb. Where do you stand on this? BOLTON: I think it's two separate issues. First, in terms of the security of Pakistan's nuclear weapons, technically I think they are secure. But it's not a technical issue. It's a political issue. If the military comes unstuck, if it divides, then the technical fixes won't protect those weapons. In terms of A.Q. Khan, I think initially, we were right to allow Musharraf to give us the information without insisting on access because it was important to get as much as we could early. I would have to say within the past few years, we should have gone back and asked for more access. But I want to emphasize Musharraf's difficulty in Pakistan. Even the military is filled with Islamicist fundamentalists that he's tried to keep in lower positions, but they're pervasive. And he doesn't have the flexibility of a real military dictator. BLITZER: So, even in exchange for $10 billion in military assistance since 9/11, the U.S. never got direct access to A.Q. Khan. And you say the U.S. should have? BOLTON: I think in more recent years. This is a very complex situation, and that's why even though martial law and the suspension of the constitution don't have much to recommend themselves, I'd have to put securing those nuclear weapons at the top of our agenda. BLITZER: Here's what Benazir Bhutto, the former prime minister of Pakistan, told our own Zain Verjee in an interview yesterday. Listen to this. BENAZIR BHUTTO, FORMER PRIME MINISTER OF PAKISTAN: Pakistan is imploding from within, and yet there is very little appreciation of the deepening crisis here. BHUTTO: I receive reports in the frontier about how the Taliban are advancing, advancing into our cities and the administration simply can't fight. BLITZER: Now, as you know, she's a secularist, she supports democracy, she's a good friend of the United States. Is she right? BOLTON: Well, I think the question is, who is better going to lead the military in that fight, Benazir Bhutto or Musharraf? BOLTON: I think it's Musharraf right now. I don't think his record has been perfect, but I think in a time of crisis like this, you need to keep your eye on the ball and that's principally the nuclear weapons. BLITZER: Let's talk about a country that supposedly is trying to get nuclear weapons. That would be Iran. The secretary of state spoke out about this the other day. Listen to Condoleezza Rice. SECRETARY OF STATE CONDOLEEZZA RICE: The United States and our partners are fully committed to a diplomatic solution with Iran. If the Iranian government fulfills its international obligation to suspend its uranium enrichment and reprocessing activities, I will join my British, French, Russian, Chinese and German colleagues and I will meet with my Iranian counterpart anytime, anywhere. BLITZER: All right. So she says the U.S. will start these high- level talks but the Iranians have to suspend their nuclear enrichment program. What do you think? BOLTON: I don't think the Iranians have the slightest intention of suspending their uranium enrichment program. We've been at this diplomatically through the Europeans for over four, going on five years. You'd have to have a near religious belief in the strength of Security Council resolutions to think the Iranians are suddenly going to start paying attention to them. BLITZER: Because a lot of experts, including the director general of the International Atomic Energy Agency, Mohamed ElBaradei, say there's no military solution to this, there's only a diplomatic solution. He was here on "Late Edition" two weeks ago and he told me this. Listen. MOHAMED ELBARADEI, IAEA DIRECTOR GENERAL: I'm very much concerned about confrontation -- building confrontation, Wolf, because that would lead absolutely to a disaster. I see no military solution. The only durable solution is through negotiation and an inspection. (END VIDEO CLIP) BLITZER: Now, he says there can be a solution through negotiation and inspection. But what you're saying is the Iranians, under this current regime, have no intention of giving up their nuclear program under any circumstances. BOLTON: Mohamed ElBaradei is an apologist for Iran. He has taken positions in flat violation of three Security Council resolutions, and he needs to learn that he works for the member governments of his agency, not the other way around. BLITZER: But he got a second term. They voted. Despite the Bush administration's opposition, he was reelected to a second term. BOLTON: He got a third term, actually, which is even worse. BLITZER: Third, and so there -- he does have the confidence of some people. BOLTON: I don't think we were effective in our campaign to oppose him. I don't think that he did nearly what we should have done, and I think we are paying the price now and will pay it into the future. BLITZER: But, you know, in fairness to Mohamed ElBaradei, before the war in Iraq, when Condoleezza Rice and the president were speaking about mushroom clouds of Saddam Hussein and a revived nuclear weapons program that he may be undertaking, he was saying there was absolutely no such evidence. He was poo-pooing it, saying the Bush administration was overly alarming and there was no nuclear weapons program that Hussein had revived. He was right on that one. BOLTON: Even a stopclock is right twice a day. Look, Saddam Hussein kept together over 1,000 nuclear scientists and technicians that he called his nuclear mujahadeen. There may not have been centrifuge cascades spinning, but Saddam had the intellectual capability to put that program right back together. BLITZER: But that was an important issue, trying to justify the war, the mushroom clouds, the fear, the smoking gun could be a mushroom cloud, and that's not just a little issue that he was right on. He was right on a major, major justification for going to war. BOLTON: I'm not aware there was any disagreement with the Bush administration that Saddam did not have the physical capacity in his nuclear program, but he did have the intention and he had the record of having pursued them in the past. BLITZER: He also said this about the early September Israeli airstrike on some sort of suspicious facility in Syria that reports have suggested was some sort of North Korean nuclear reactor facility that they were building to develop centrifuges in Syria. Listen to what ElBaradei said to me on this program two weeks ago. ELBARADEI: To bomb first and then ask questions later, I think undermines the system it and doesn't lead to any solution to any suspicion, because we are the eyes and ears of the international community. It's only the agencies and the inspectors who can go and verify the information. BLITZER: He said if the Israelis were concerned, they should have gone to the IAEA and made their case and then the inspectors, presumably, could have gone in since Syria is a member of the Nuclear Non-Proliferation Treaty. BOLTON: If you believe that, I have a bridge to sell you. The notion that Israel or the United States would put their national security in the IAEA's hands is just delusional. And let me make one important point. Eyes and ears of the international community? Look, the IAEA functionally gets most of its sensitive information from foreign intelligence services including our own, and that's why it's more properly called the U.N.'s nuclear watchpuppy. BLITZER: So you don't believe, obviously, this guy, anything he's basically saying? BOLTON: I think he's actually undermining the credibility of the IAEA by his overly politicized role in the Iran crisis. BLITZER: When you say "surrender is not a option" in your new book, what do you mean? BOLTON: Well, actually I've said that title to a lot of my friends, former political appointees at the State Department, and they laugh at me and they say, "What do you mean? Surrender is an option. We do it all the time." My point is that America's diplomats should be advocates for America. They should be instilled with a culture of advocacy, not with a culture of retreat.